Astigmatism is a vision issue caused by an irregularly shaped cornea (the front surface of the eye) or curvature of the lens inside the eye. The defect causes a refractive error, meaning the eye is unable to bend light properly. This allows only part of the object to be in focus at one time, because the light bends more in one direction than the other. Depending on the degree of severity, astigmatism correction can vary by person. The overall cause of astigmatism is unknown. While astigmatism can be present at birth, it can also develop following an eye injury or surgery. Astigmatism can also occur as a result of keratoconus, a rare condition in which the cornea gradually thins and begins to bulge into a cone-like shape. The most common symptom of astigmatism is blurred or distorted vision. Blurred vision can lead to additional symptoms such as headaches, eyestrain and excessive squinting. Visual acuity: Reading letters on a distance chart can measure visual acuity. Normal distance visual acuity is 20/20. Keratometry/Topography: A keratometer is used to determine the curvature of the cornea by focusing a circle of light and measuring the reflection. A contour map of the cornea can be generated from a corneal topographer to see even more detail of the shape. Refraction: A phoropter is used to place a series on lenses in front of your eyes to measure how they focus light. This also involves a lighted instrument to evaluate the focusing power of your eye. Astigmatism can increase slowly, so you should visit your eye doctor either once a year or if you notice changes in your vision. HOW CAN I ACHIEVE ASTIGMATISM CORRECTION? Eyeglasses: Eyeglasses are used primarily to correct vision. For astigmatism correction, the eyeglasses will have a cylindrical lens prescription for additional power in specific parts of the lens. Contact lenses: Contact lenses can offer a wider field of view than eyeglasses. Refractive surgery: Refractive surgery such as LASIK can correct most types of astigmatisms. 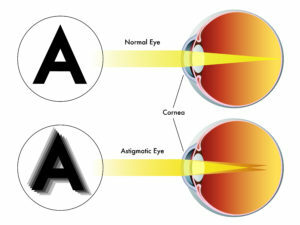 Astigmatism correction depends on the degree of severity of the astigmatism. If you have not seen results with any of the methods above, or have had complications from LASIK surgery, Laserfit Lens can help! Contact us today to find out more information.